Adam Greathouse is an Army Veteran, corporal in the Third Infantry Division, Field Artillery. In 2001, near the end of his duty day in Kosovo, his sergeant gave him the rest of the day off so he took a nap. When he woke up, he couldn't move. There was pressure on his chest and he started hallucinating. He was sent to a German university hospital where his organs started failing, his heart became enlarged, tubes going in and out of his body, all while he passed in and out of consciousness. He had no control. With the magnitude of trauma to his body, having lost oxygen to his brain, he suffered a traumatic brain injury (TBI). Suffering from a severe anoxic event that damaged many organs including his lungs and brain, he went into a coma lasting two months. He was diagnosed with a traumatic brain injury (TBI) including partial amnesia, memory loss, and physical paralysis. Uncertain of his condition, months went by and depression set in. Beaten to the core both physically and mentally, he lay there broken, waiting to die. He had lost more than half his body weight and was frail with hardly any muscle mass. With the help of VA, Greathouse has learned to adapt to the disabilities caused by the TBI over the years. He pulls tools from his mental toolbox to handle life's situations and to maintain his current active lifestyle. Each night, he sets cell phone alarms to make sure he is on time in the morning. He does brain training games before bed. Today he helps other Veterans conquer challenges as an ambassador at the National Veterans Summer Sports Clinic. His first VA Adaptive Sports event was the National Disabled Veterans Winter Sports Clinic in 2012, which he followed up with the National Veterans Summer Sports Clinic later that year. In 2014, he started volunteering at the Huntington VA Medical Center in West Virginia as the first voluntary recreational therapy peer support specialist, driving more than three times a week over two and a half hours each way. He was very involved with sports before his injuries, so he continues to eat right and stay active. In social settings, he says he must be fully present to not deter his concentration, knowing how many distractions are all around him. Volunteering weekly has given him a sense of purpose. 'I know that when I was in the process of going through it if someone I should have been able to count on said they were going to be there and they didn't show up, then I would know the whole system failed and I would never come back. I'm not going to let that happen,' he said. 'Suddenly, BAM, I'm a soldier again,' Adam said, after sharing how much these clinics have brought him back from the darkest days of his life. He frequently takes his children out surfing and snowboarding, knowing how many years he missed, watching them from the sidelines, unable to walk. He bought his first house in 2017 and is fixing it up with his dad. You can't miss him in the crowd, just look for the man with the biggest smile. 'It's an honor to be here and watch my brothers and sisters grow in confidence every day. By the end of the week, they have permanent smiles! It's a life saver, a game changer,' Adam said of the 2018 Summer Sports Clinic. Greathouse was also named as a Veteran of the Day. 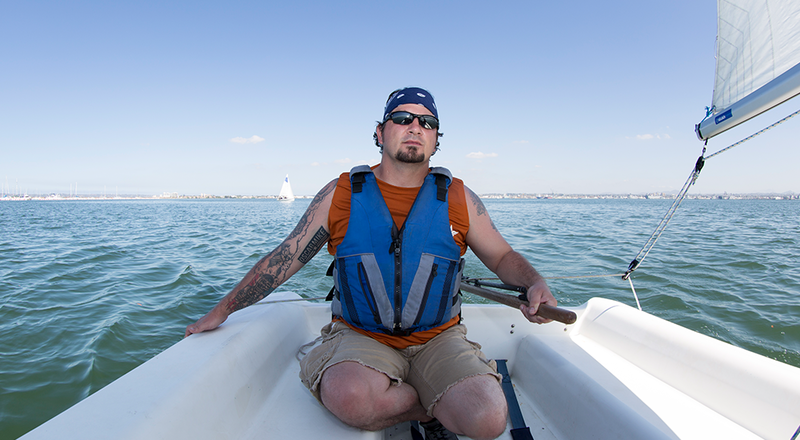 VA's Summer Sports Clinic offers adventure sports and recreational activities such as sailing, surfing, track and field events, kayaking and cycling. The week-long journey hosts Veterans from all over the country who have a variety of injuries, ranging from traumatic brain injury and polytrauma to spinal cord injury or loss of limb. Its fundamental purpose is to provide early intervention for Veterans battling back from injury, not only strengthening their bodies but overcoming and improving their overall being and self-worth. It's underway this week in San Diego. Megan Kon is the Public Affairs Officer at the Maine Healthcare System.